One minute I was CK grooming; the next I was Sneezy. I succeeded in panicking TW yesterday morning. It was the first night she let me back in our bedroom since she threw me out months ago. What started out as a typical morning, soon turned ominous. v-e-t and, to hear her talk, I was close to death. Doesn't she ever get a piece of her fur stuck in her nose like I did? Once it fell out, I was fine. I only sneezed once more all day. These darn humans are such worriers. What is their problem. Glad it was just a piece of hair tickling your nose. Have a great day. That is Peeps for you Keisha. They luv ya so the brain goes out the window, Glad it was nothing to worry about. Have a terrific Thursday. Glad it was short-lived, CK. No cat ever WANTS to have to go to the vet! Binga has had sneezing fits like that too. Actually, hers are respiratory-related - she had a very bad cold when she got sprung from kitty jail (i.e., the pound), and left her system a little weak. So she is always the first one among us (humans included) to get colds. They usually clear out on their own, without veterinary intervention. CK, what you need to do (now that you're back in the bedroom) is sneak a little tuft of your fur into her nose. I guarantee it will be worth the laugh. 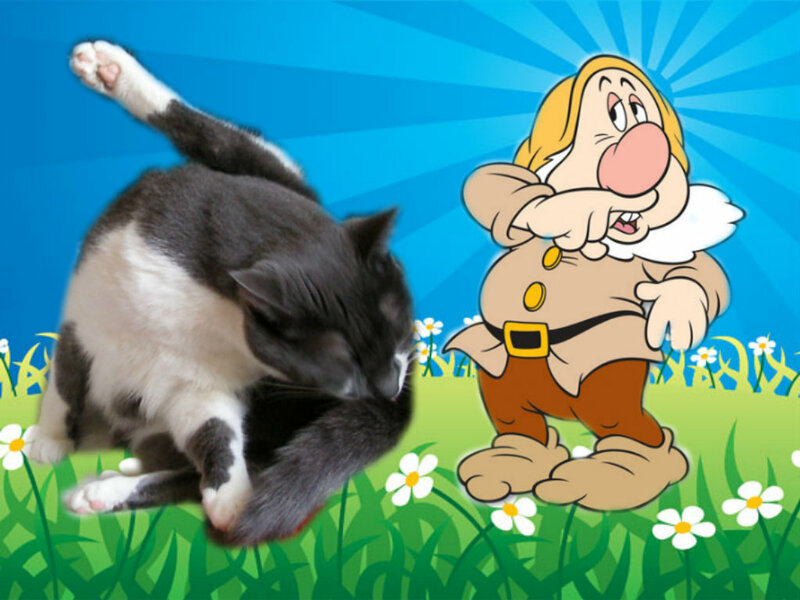 hey, I say as long as you aren't leaving a snot trail, you're fine..
CK...well, ya shoulda toll yur mom thanx ta sneezy ya felt grumpy but dinna knead ta see doc coz he made ya feel bashful when all ya trooly kneaded was ta bee happy by actin like sleepy :) !! I leave green boogers on mom. that's when she takes me to vet. sneezing? puleeze, TW. get a grip. Yeah, humans get all crazy like that sometimes. We are glad you are okay, CK. MOL! I'm sorry, but I'm dying laughing about the hair in the nose! Too funny! Yeah, that'll make you sneeze! I can sympathize with the panic, I'm an easy panicker too! Now you know what to do the next time TW gets annoyed at you about something. Start sneezing and watch her forget what she was annoyed about! he he - I know exactly what you mean. The peeps blow everything out of proportion! They have us half dead when it's totally nothing at all. Sigh! It's a rough life we lead! Cut TW some slack, I would have been exactly the same! Sheesh, she sounds like our mom...a real worry wart! Tee Hee! Me does that when me gets hairs up my nose! Me has some short spiky ones round my tail ans they gets wedged sideways and me sneezes and sneezes and sneezes! Mommy had to gets it out before me stopped! I can TOTALLY throw my Human into full-fledged panic by doing the LEAST little thing differently. Honestly, it's so hilarious sometimes I do things on purpose. I guess it's nit very nice of me, but hey--I'm a cat. Who said I was 'spozed to be 'nice'? You really sure you is goods? We still has to blog about Nip Award we gotted from you. So sorry we not has yet. Oh yes. Our pawrents go crazy if we do the least little thing different! Drives a cat crazy! Hello darling, Hope you are well and not sneezing. Say, how's that Tower doing? XOXOXO I can't wait to visit you on it. Allie: *sigh* Mother did this with me yesterday. I just had a teens hairball hack. Geeeeez.